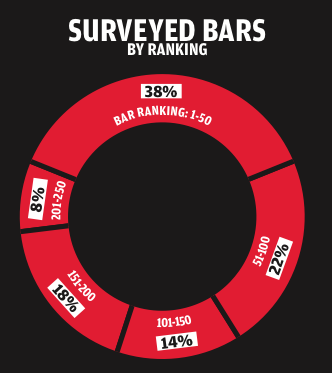 We’re proud to say that 38 of The World’s 50 Best Bars took part in this survey. That’s a great return, given there’s no prize at the end – bar this splendid report, naturally. But just as one swallow doesn’t make a summer, 38 bars don’t make a survey. We widened the scope to 100 to take in some of the other many great bars in the world that received votes in our World’s 50 Best Bars poll. Each year we only publish the names of the top 50 bars, but that’s the tip of the garnish of this particular cocktail. In total our Academy voted for 499 bars. We contacted the top 250, taking the responses from the first 62 bars that came back to us. You can see the final split of the 100 respondents in the pie chart. But where are these bars based? You can see from the bar chart that European bars were the most receptive to our overtures. Just over half of the responding bars ply their trade there, while 20% of those that answered were from North America. With more than 70% hailing from two continents, this might seem an imbalance, but of the top 250 bars that received votes – and latterly our survey– over two thirds were from Europe and North America. 8% of our surveyed bars were from Australasia – a region which made up about 6% of the 250 best bars in the world. 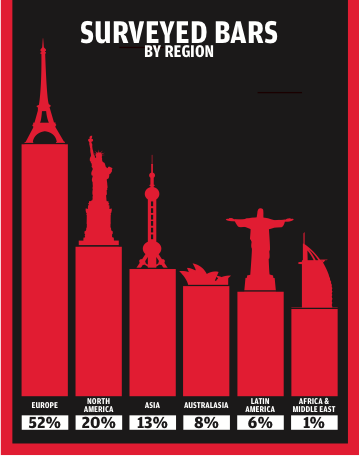 Latin America was under represented at 6% of our respondents versus 9% of the top bars in the world. We may only have one respondent from Africa and the Middle East, but there were only a handful of bars from this region that made our top 250 ranking. Why does this matter? Well, perhaps it does, perhaps it doesn’t. In today’s global industry, there will be trends that are particular to the top bars wherever they call home. Certain products are aimed at a certain level of establishment – whether because of type, use or price – and among the elite bar community ideas and knowledge are shared openly, which could create a consistency of opinion. That said, distribution and marketing in large developed markets such as the UK or the US is different to that in Latin America or Africa and the Middle East.